Who knew? 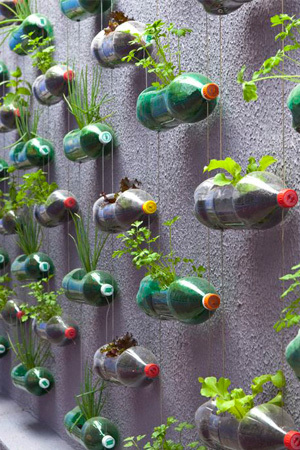 You can turn those leftover soda bottles into a vertical garden with some supplies and a bit of crafting skills. 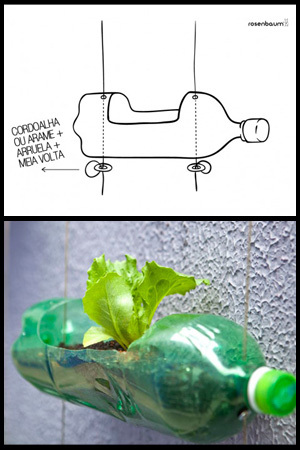 This is Do-It-Yourself (DIY) vertical gardening. To secure the bottles, you must make two holes at the bottom of the cylinder and two at the top of the bottle. See the pictures for an example. In addition to the holes to pass the rope, you need a small hole in the bottom of the bottle. The water used to irrigate the seedling needs to drain. After that, thread the string through a hole and pull out through the other. Note: Many people have asked how to make sure the bottles do not “slip” on the rope (or string or cordage). Either tie a large knot in the rope or tie the knot around a washer. Then simply stretch and attach the rope to the wall. 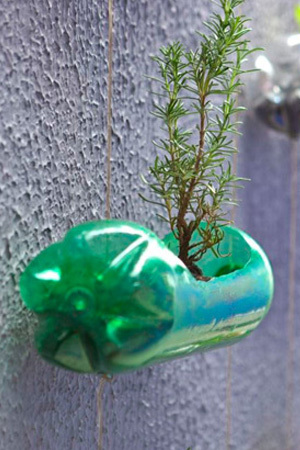 Make your space a little greener, using recycled materials. There have to be more creative ways to introduce plant material to wall surfaces than this. This is not appealing at all. Clever doesn’t automatically promise success. Furthermore, how much time and/or wasted water is required for this wall? I’d be curious to know. Using hanging plants will eventually coverup the bottles. I don’t think anyone would try to water these one by one. Ever heard of the new invention called a hose? This would be a cute project for elementary school kids. This is such a great idea! We are actually putting this wall in at our elementary school as a part of the green living program. how do you attach rope to concrete walls? You either have to use tape or use a nail. Great for the ecosystem. Helps keep plastic bottles out of landfills and waterways. Succulents would be ideal in these since they don’t need a lot of water. 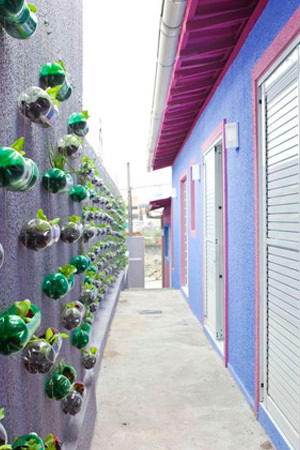 This would be great for a class science project where each child/student can water and manage their own planting. BUT if this was for home use…it would be too time consuming to maintain, groom, fertilize and water it regularly. Also, when your done with this project, too much water would be needed to clean and recycle the bottles. This is great and I’m just thinking about when the plastic heats up from the sun and chemicals leaching into the soil…do you have any information on that? I’ve always wondered about this, too. It’s not just this case but nursery pots ar always plastic. Irrigation lines are plastic that degrades into flaky bits impossible to contain. But what is the cost effective alternative. I should add that I don’t think PET, which is what soda bottles are made of as far as I know, are known to leach much. I would hope that soda bottles, and other drink containers etc, are food safe and do not leach chemicals ! Many thanks to Rosenblum for this concept n of course thx to Phil for your efforts. Good project. some people can always comment in the negative but i personally it’s a good one giving place for numerous plants. Seems best for compound walls. Dirt? Really? Soil, soil mix, etc. anything but DIRT! Dirt is what you put in a dust bin, soil or a soil mix, well, if you are really a landscape architect, you know the difference, have specified difference mixes for different purposes, and understand the complex and life giving properties of soil. Enough said. Better not to make plastic bottles in the first place. OMG THIS IS SO GOOD I LOVE THIS WEBSITE YOU SHOULD TOTALLY LEND US SOME PLASTIC BOTTLES SO THAT MY SEVENTH GRADE CLASS AT CREATIVE ARTS CHARTER SCHOOL CAN DO THIS TO! Do the bottles have to be 2-liters or could they be substituted for the average 20 fluid ounce bottle?